In a comparison of the antioxidant content of 280 common beverages, hibiscus tea, derived from the flower of the same name and also known as roselle, sorrel, jamaica, or sour tea, ranked number-one, even beating out the oft-lauded green tea. Within an hour of consumption, the antioxidant power of your bloodstream shoots up as the tea’s antioxidant phytonutrients are absorbed into your system. What effects might this infusion have on your health? High blood pressure is where hibiscus really shines. A study from Tufts showed that three daily cups of hibiscus tea significantly lowered blood pressure in prehypertensive adults better than placebo, with a drop in the subjects’ systolic blood pressure by six points over the control group. To put that into perspective, on a population scale, a five-point drop may lead to 14 percent fewer stroke deaths, 9 percent fewer fatal heart attacks, and 7 percent fewer deaths overall each year. 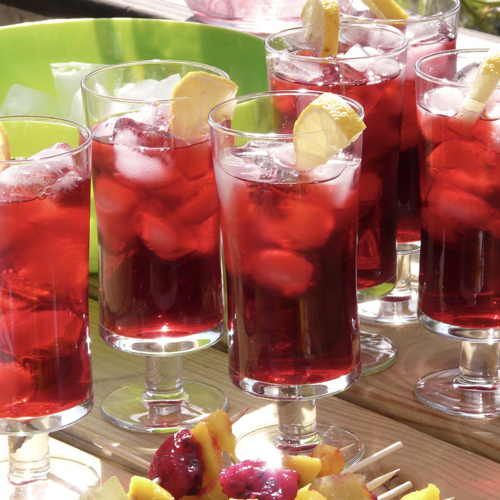 What happened when hibiscus tea was tested head-to-head against a leading blood pressure drug? Two cups of strong hibiscus tea every morning (using a total of five tea bags) was as effective in lowering subjects’ blood pressure as a starting dose of Captopril taken twice a day, but without the drug’s side effects. My Daily Dozen recommends five daily servings of beverages (one glass or 12 ounces), and two of my favorites are hibiscus tea and my Hibiscus Punch concoction. After drinking the tea, rinse your mouth with water to keep the tea’s natural acids from softening your tooth enamel. And, given the extraordinary manganese content in hibiscus tea, I wouldn’t recommend drinking more than a quart a day. Image Credit: Emily / Flickr. This image has been modified.